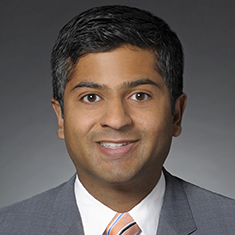 Yashas Honasoge is an associate in the Intellectual Property group at Katten Muchin Rosenman LLP, where his practice focuses on complex patent litigation and related intellectual property matters. Yashas has a breadth of experience representing and counseling clients throughout all stages of litigation, and has represented clients in federal district court, and before the Patent Trial and Appeal Board and US International Trade Commission. With a deep understanding of electrical and mechanical arts, Yashas is able to quickly understand complex technologies and bring this knowledge to bear during litigation. He has successfully represented clients in patent suits involving a wide array of technologies, including wireless communications and cellular standards, vision-based driver assistance systems, and portable consumer media devices. Shown below is a selection of Yashas’s engagements.